Childrens's Discos, Children's Parties, Children's Entertainer, Teenage Discos, School Discos School Proms, Birthdays, covering North and West Yorkshire. Photo Booth Hire available in Newsome with or without a DJ. Fully organised and hosted games and competitions (Age Group Dependent). Bubble, haze and smoke machines (Venue Dependent). Sound system and special effect lighting. An organised and structured party. An interactive DJ, CRB checked to work with children. Fully organised party dances and activities. Our children's discos are fun for children and parents, we organise party games, competitions and entertainment for everybody. Included in the fun is special effect lighting, bubbles and haze/smoke machine at no extra cost. Some venue don't allow bubble and/or smoke machine use, but they are always brought with us. Radio Mic's are used to give the DJ freedom to interact with the children and organise games efficiently. All of our Entertainers are CRB checked to work with children. For a fabulous children's birthday party we can provide music for any themed party from High School Musical to Mama Mia. We also provide UV lighting to give a great glowing atmosphere at Neon Parties. "Hi, just want to say thank you very much for doing Amelia's 4th birthday party, you were brill, everyone commented how good you were. Their kids went to bed early that night as they were tired from the party, it's a shame you can't do the 27th March in Wakefield, but I will definitely use you again for my parties. Thanks Again Kate and Andy xxxx." 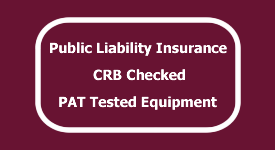 For many school disco's and school proms the DJ needs to be CRB checked and have Public Liability Insurance. Both these certificates can be provided on request. We have many years of experience hosting schools discos from large comprehensives to your small primary schools with each disco taylored to the schools requirements. Our Equipment is PAT tested which is now a requirement in many schools. Games we provide as part of our service are listed to the right, but other games can be played by request. Pass the Parcel and prizes for games and competitions must be provided by the customer.